Legal scholars explain misrepresentations utilized by opponents of planned deportation of illegal infiltrators. 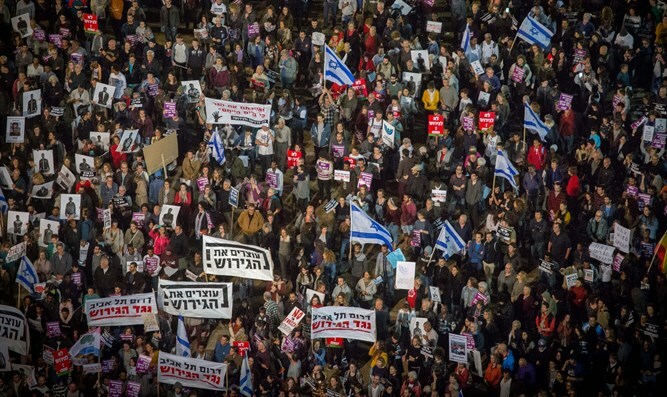 According to various reports, more than twenty thousand people gathered yesterday, Saturday night, in Tel Aviv for a demonstration against the expulsion of illegal infiltrators, and many arguments have been made against the Israeli government's policy towards the infiltrators. Attorney Aharon Gerber and attorney Shira Kahn of the legal department at the Kohelet Policy Forum examined these arguments. In an interview with Arutz Sheva, Attorney Kahn presented some of the insights they reached. According to Kahn, the discussion surrounding the issue of illegal immigration and Israel's treatment of the some 40,000 infiltrators living in Israel is plagued by disinformation and demagoguery, and that opponents of the government's plans to deport thousands of illegal immigrants misrepresent a number of statements made by the government and the leaders of the movement to deport the infiltrators. "They say that 'the government is deporting refugees to their deaths,' this is not true - the plan will be applied only to infiltrators who did not apply for asylum or whose applications were rejected, and not to refugees. In fact, the estimates are that about half [of the infiltrators] will be included in the plan," she said. Attorney Kahn noted that the ages of most infiltrators from Africa, ages 25-45, are typical of migrant workers rather than refugees, as is acknowledged throughout the world. As for the claim that "the deportees are sent to their deaths," Kahn says that this statement is not only directed against the government but also against the court. The Supreme Court, which examined what was happening in Rwanda, confirmed that deportation to that country was safe and legal. Israel's control mechanisms were also examined. The policy of accepting the refugees in Uganda is one of the most advanced in the world today. She also notes that since 2014, more than 2,500 infiltrators from Israel have voluntarily left for Rwanda and Uganda after receiving a grant from the State of Israel without fear of their lives. She said that those infiltrators who chose to leave voluntarily to the third countries did so because they understood that the State of Israel would not grant refugee status to someone who is not entitled to it. Kahn notes that, contrary to statements made by supporters of the infiltrators, the court ruled that the horror stories about the future of those displaced in Rwanda, hunger, imprisonment, forced recruitment, slavery, and death are all unreliable. "There are judges in Jerusalem who determined that there is no basis for this." On the claim of the secrecy of the agreements with the target countries, Kahn says that this is a well-known practice of secret agreements, "and it should be remembered that even if the agreements are confidential in the legal proceedings, the Supreme Court examined and approved the agreements and the implementation and control mechanisms included in them." Even the moral argument about the past of the Jewish people as a people of refugees that can not do to other refugees what they have done to it, Kahn rejects. "Israel is committed to the Refugee Convention, acts accordingly and conducts judicial review in light of the fact that the treatment of the asylum application has not yet been completed, will not be removed, even though the Convention permits even the deportation of refugees to a third country." In her opinion, conflating the deportation of the infiltrators to "the refugee situation during the Holocaust, or of refugees in general, is demagoguery for its own sake." Regarding the claim that infiltration has already been halted by the fence, and in fact the 37,000 people can bee absorbed, Kahn says that the official absorption of infiltrators will restore the motivation to illegally infiltrate Israel: from the sea, the desert, Ben-Gurion airport, through tunnels and other ways. In this context, she notes that according to European precedents most of the migration from Africa to Europe is carried out by sea without a common border. "The whole world is facing a wide-ranging" nation-wide migration ", which is realizing waves in different directions according to changing circumstances, as soon as the gates of Europe become smaller. If it is in the interest of migrant workers to come, they will come. " The document they produced in Kohelet's legal department also mentions that this number of 37,000 people does not include birth, a future demand for family unification and, in fact, the creation of new ethnic-national minorities in Israel. Another claim that Kahn rejects is the claim that "the expulsion is applied in a racist manner against people of African origins. In 2017, Israel deported 3,361 Ukrainians and 844 Georgians after their requests for refugee status were examined and rejected." She also rejects the argument that Israel, in any case, brings foreign workers to it, and therefore it is appropriate to use the labor force of the infiltrators from Africa instead of importing from Romania, Greece and other countries. "The State of Israel does not need immigrants to settle in. It needs working hands, but it does not workers who will settle here, so it brings in more foreigners who know when they will leave." In her opinion, this is an irresponsible argument regarding the future of the state. When asked whether she believes the Israeli government is doing its utmost to clarify its steps against the infiltrators, Attorney Kahn said: "This is an interesting question that is difficult to answer now, because it is very easy to make noise, and this is what the opponents of the expulsion are doing, but in a sense we were surprised by the ' And the demagoguery of the campaign. After all, we saw how the High Court of Justice rejected all the claims, and we were surprised that they went unchecked in front of an outline approved by so many elements. " In her estimation, the opponents of the infiltration campaign managed to bring thousands to the streets against the deportations, but a discussion with the people on the street reveals that this is not the opinion of the majority of the public. At the same time, she warns that this is a matter of excessive and early complacency, and in fact there is a need to embark on a publicity campaign to clarify the project and the plan first and foremost to the citizens of Israel themselves.